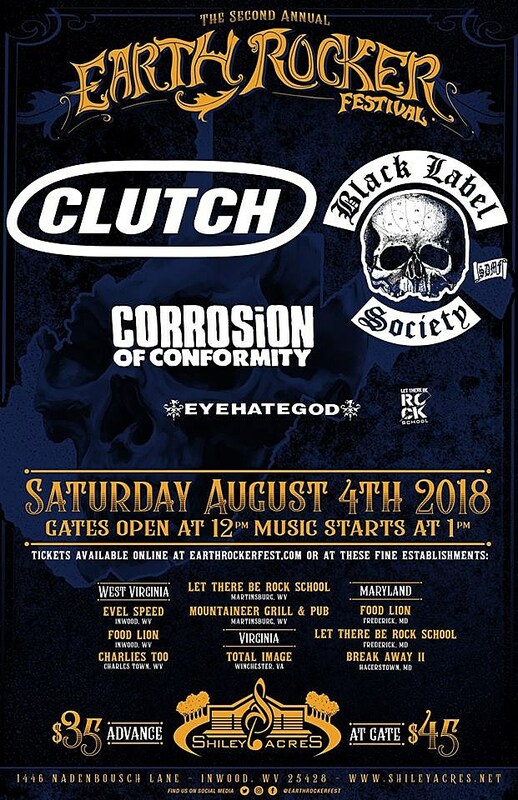 Like last year’s inaugural offering, Shiley Acres and Clutch have worked together to make Earth Rocker Festival 18 a fan and band friendly event. Earth Rocker Festival is a day time event. The festival opens the gates at 12 noon and music runs all day ending right before the sun sets. The festival has a designated camping location and will offer free camping on site the day and the night of the festival. Other fan friendly elements include free parking starting at 9am the day of the event, free admission for accompanied children under 12, and allows lawn chairs and pop up tents in designated areas. As Greg Shiley, owner of Shiley Acres puts it “There will be plenty of good food, beer choices and all at reasonable prices, so come spend a summer afternoon enjoying the great bands and open air. We’ll make that real easy for ya”. Clutch have other tour dates coming up too, which are listed here.